Dumore Series 35 hand grinders include a high speed Dumore motor with ample power for grinding applications using rotary files. 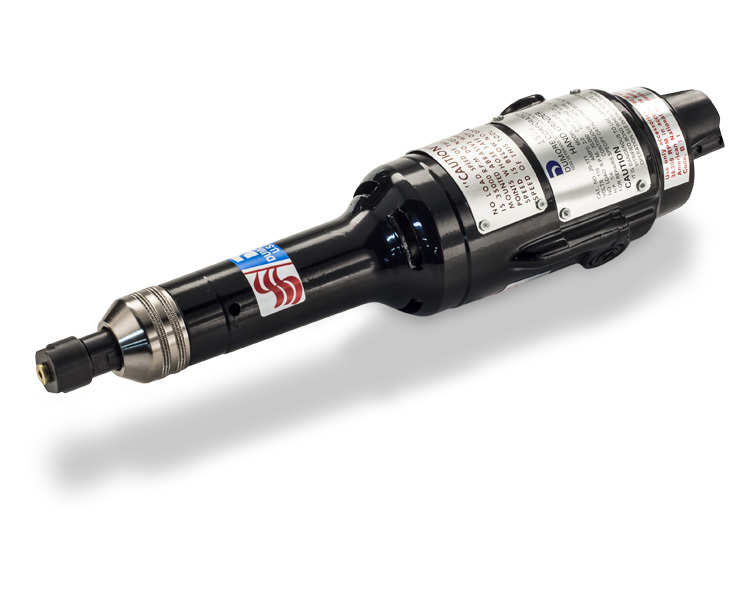 Accessories enable easy conversion for 3 types of grinding all with this one grinder - as a hand grinder, mounted on a lathe as a tool post grinder, and as a flexible shaft grinder with addition of the flexible shaft and handpiece. The slim, easy to handle die cast aluminum housing is lightweight, yet strong and durable. Three precision lubricated bearings ensure rigid spindle support for extended use and minimal run-out. Changing between 1/4" and 1/8" shaft diameter rotary files and mounted points is fast and easy with the included 1/4" collet chuck and 1/8" reducing collet sleeve. A back mounted "on-off" switch provides additional operator safety. Optional table top and foot switch speed controls are also available. Series 35 hand grinders are available individually so you can choose the accessories needed for your application, or as part of the complete Rotary Tool Kit, which includes the assembly for mounting on a lathe, kit for use as a flexible shaft grinder, and a large assortment of rotary files and mounted points, all in a heavy duty metal carrying case.